I recently read Chad Fowler’s The Passionate Programmer , and he mentions the importance of reading other peoples’ code. This reminded me of something I’ve kind of had in mind for a while, which is to do a deep dive into some parts of the Ruby on Rails code base, in order to better understand how certain things work. The first thing I’d like to explore is the startup process, and the first part of understanding that is learning how it loads all of the relevant pieces of code before things start. For the first part of this exploration, I’m going to look at Ruby’s lowest level primitives for loading code (i.e. the require method and related methods). In the second part, I’ll take a look at how RubyGems works and in the third part, I plan to tackle how bundler comes into play. If an explicit path to a file was specified (i.e. absolute path or path starting with dot), it will be loaded. If a path is not specified, the directories contained in the variable $: or $LOAD_PATH (both refer to the same array) are searched for the file requested. If the file is successfully loaded, the full path will be added to the $" or $LOADED_FEATURES array. The file will only be loaded once, so it is safe to call require as many times as you want. In a modern version of ruby, RubyGems will be loaded at startup, and it will augment the logic to the require method, so things get a lot more complicated. We will be looking at RubyGems in part 2, but we want to ignore it for now. For demonstration purposes, we’ll disable RubyGems and poke around a bit. Remember, $: or $LOAD_PATH is the list of directories that are searched when require is called. This shows the current list of paths with our fresh IRB console. So, for example, if you type require 'foo', ruby will search each of those directories for a foo.rb, foo.so, etc. So, you can see there are just a few files loaded at startup with a plain ruby. Now, lets’s see what happens if we load another library from the standard ruby library (we don’t have RubyGems loaded, so we can’t load gems right now). Here, we create a copy of the original value of $", then we can then check what was added to it after calling require 'net/http'. When calling require 'net/http', ruby looks through its load paths, which includes /Users/alwold/.rvm/rubies/ruby-2.1.2/lib/ruby/2.1.0 (which we saw earlier) then it looks for net/http with various extensions, finding /Users/alwold/.rvm/rubies/ruby-2.1.2/lib/ruby/2.1.0/net/http.rb. That file then requires various other files, some of which require other files and so on, resulting in the eventual loading of all of the files we see in the previous output. Each file that is loaded is evaluated by the interpreter, defining methods, classes, modules, etc. and executing code at the top level. In our case, this results in the Net::HTTP class (and lots of other stuff) being defined, at which point we can call its methods and make HTTP connections. Another method of interest is the require_relative method. require_relative is similar to require, except that it loads a file using a path relative to the script that contains the call to require_relative. So, for example, if you call require_relative 'bla' from within the file /foo/bar/baz.rb, the file /foo/bar/bla.rb is loaded. This is useful when you have a set of files, where you want to require to one file from another. With the normal require method, relative paths use the current directory as the starting point, and the current directory can be pretty unpredictable. With this in mind, it’s nice to be able to refer to a file relative to the path of the calling file. Other methods of interest are the load and autoload methods. The load method is similar to require, except that it will always load the file, even if it has already been loaded. autoload can be used to trigger automatic loading of a file when particular constants are referenced. One thing to note is that only the require method is subject to the RubyGems magic I mentioned earlier. The require method is pretty simple, but it’s the basic building block for most of the code loading mechanisms in ruby. I think knowing the details of how it works will be helpful in understanding the way RubyGems and bundler work in further explorations. It should also be helpful in diagnosing any future issues with code loading. This entry was posted in Uncategorized and tagged rails, ruby on September 16, 2014 by alwold. Recently, I shared a post that demonstrated how to integrate CorePlot into your Swift-based iOS project. That post covered the basics of how to get started, but there’s an issue with using CorePlot which can cause problems pretty quickly once you get into building your graphs. CorePlot makes heavy use of the NSDecimal type in Objective-C, which is a special C struct used to store decimal numbers. Swift doesn’t directly support NSDecimal, so any methods that use it in CorePlot APIs are simply missing when you try to access them from Swift. Everything goes fine until you try to set the length of the x range. 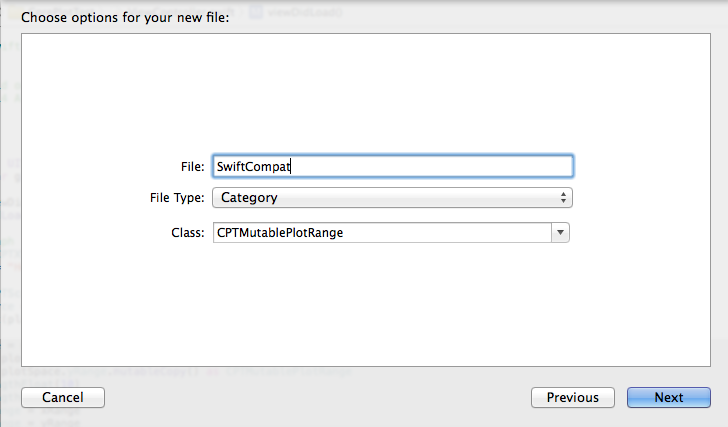 The length property on the CPTMutablePlotRange is represented as an NSDecimal, so it isn’t bridged into Swift. Luckily, there’s a pretty easy workaround. 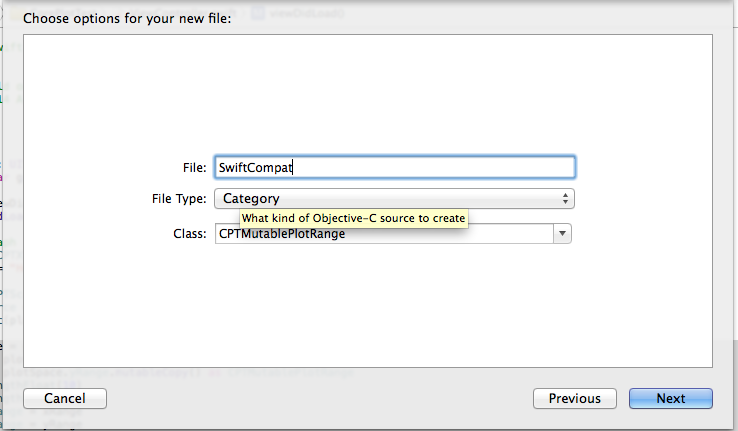 By adding a Category for the classes you are using, you can add wrapper methods which use a supported Swift data type. In our case, we’ll be wrapping the CPTMutablePlotRange object in CorePlot, so that we can set the area displayed by our graph. The last step is to make sure to import CPTMutablePlotRange+SwiftCompat.h in your bridging header (see the previous post for how to set up your bridging header). Once you do that, you should be able to access the new setLengthFloat method any time you encounter a CPTMutablePlotRange. Cool. It’s not very pretty, but it’s showing all of our data now. As you come across other methods/properties that need an NSDecimal, you can create/add to your categories to wrap the functions. This entry was posted in Uncategorized and tagged coreplot, ios, swift, xcode on September 3, 2014 by alwold. I just started working on a new iOS app right after the Swift announcement, and decided to try writing it in Swift. I needed to add some graphs to the app, and after looking at the options, I decided to give CorePlot a try. 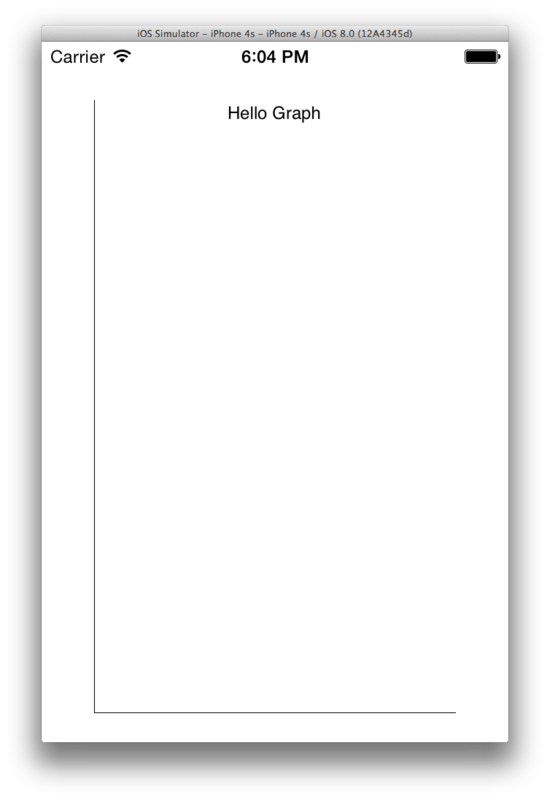 I wasn’t sure how things would work out with CocoaPods and a third party Objective-C library from a Swift app, but I was able to build something that works pretty well, so I’m going to outline how to do this with a quick sample app. If you want to go straight to the code, my sample app is available on GitHub. 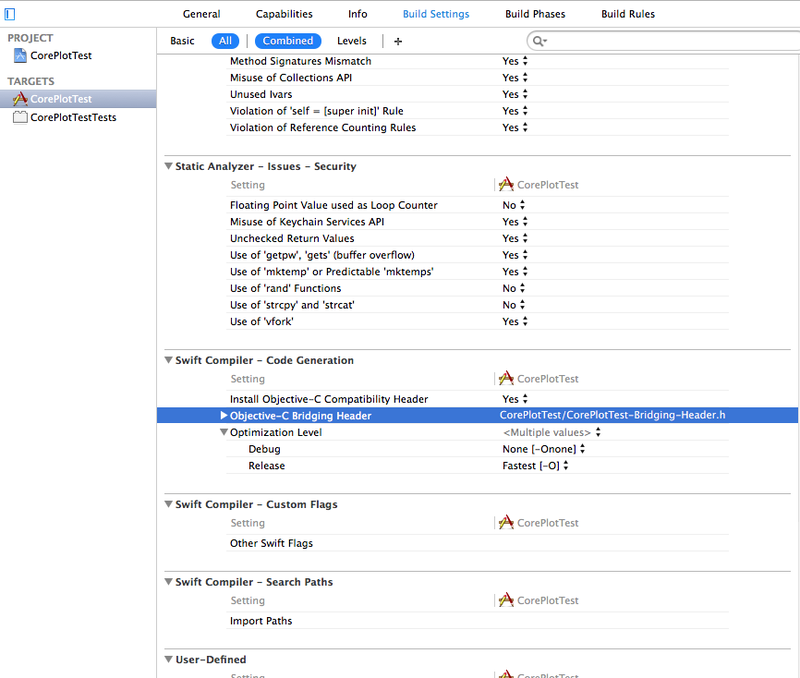 Now, you have to close the project in XCode and open up the newly created workspace for your project. The workspace file has a .xcworkspace extension, and should be in your project directory. Opening the workspace will give you access to your original project, plus all of the CocoaPods you’ve installed in the project. At this point, if you were writing an Objective C app, you’d be able to start adding CorePlot functionality to your app, but we need to do few things to get it working in Swift. Create a new header file in XCode, by going to File->New->File…, and select Header File (under iOS->Source). Call your header file <app>-Bridging-Header.h, where <app> is your app’s name. You can read more about bridging headers on Apple’s guide on interoperability. 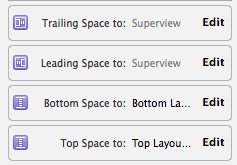 Now, you have to tell XCode about the bridging header. This should enable access to CorePlot from Swift, let’s try it out. Create an outlet for the view in your view controller. Call it graphView. Add the CPTPlotDataSource methods. 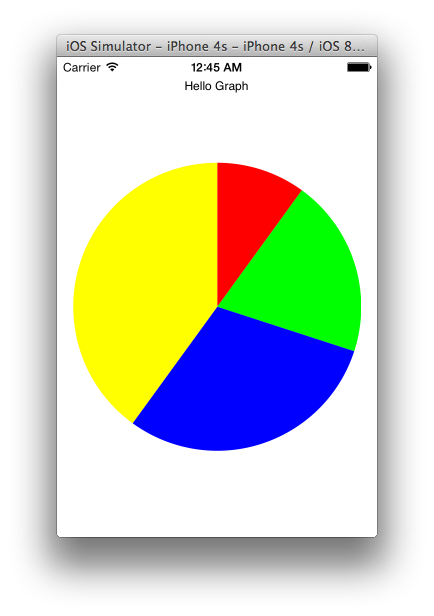 The samples below will create four sections in the pie graph, and the size of each section will be equal to its position plus one (i.e. 1, 2, 3, 4), so we’ll get a graph with some variety. This shows the very basics of how to get up and running. There are some further caveats, especially with calling methods that involve parameters of the NSDecimal type. My solution for that was to add some Objective-C wrapper code. Hopefully, I can show how to do that in a future post. Update: I have a new post describing how to deal with APIs that use NSDecimal here. This entry was posted in Uncategorized and tagged coreplot, ios, swift on August 7, 2014 by alwold. I tried it out, and it generated a huge number of resource files, plus it was using images for the solid color parts, so I wasn’t very happy with it. This gave me an idea of how the style needed to be structured, but seemed incomplete (I couldn’t find some of the referenced drawables, like “ad_tab_unselected_holo”). Between the two examples, I was eventually able to figure things out and build a working solution. actionBarTabStyle – This determines the style of the tabs themselves. The tab is the area that includes the text, its background, and the little indicator bar under the text. 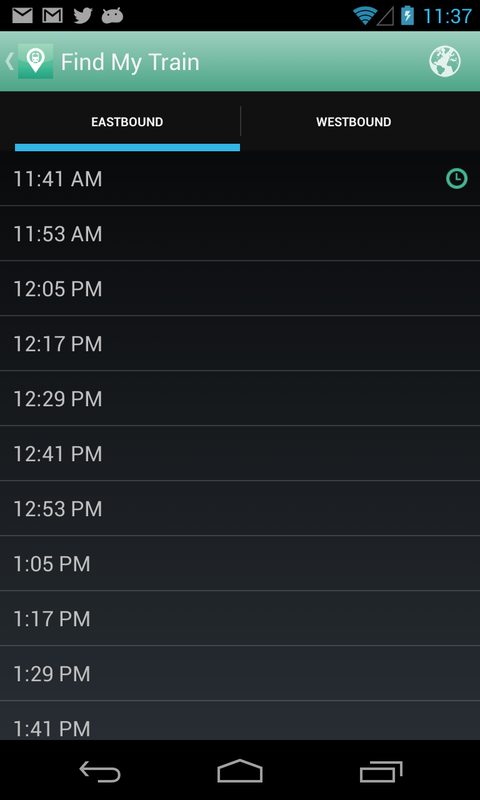 If you want to customize the indicator like I did, you need to alter this one. actionBarTabBarStyle – This determines the style of the overall tab bar. It includes the whole container that includes all of the tabs. actionBarTabTextStyle – this one I didn’t use, so I’ll assume the official docs explain it properly. To give you a better idea of how the actionBarTabStyle and actionBarTabBarStyle work, I’ve included a screenshot below, where the actionBarTabStyle has the background set to red, and the actionBarTabBarStyle has the background set to blue. You can see how the blue background covers the whole tab bar area, and the red backgrounds cover each tab. 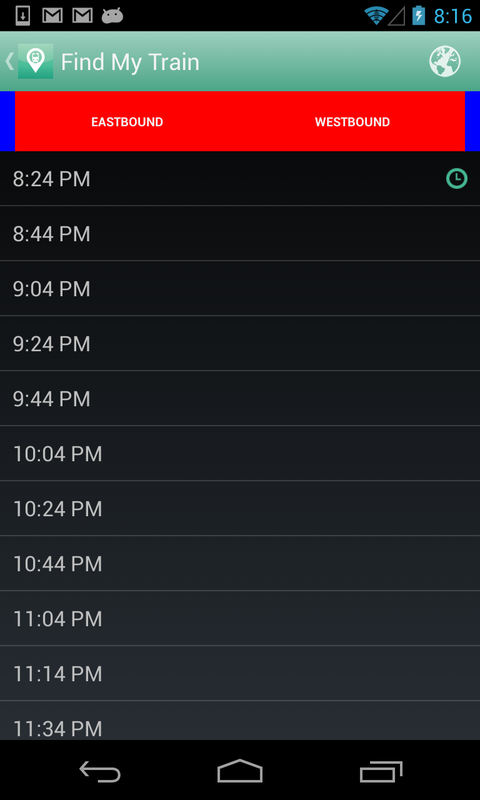 Create the theme for the app, the action bar, and the tabs. We need to set the background for the tabs to the “tab_bar_background” drawable. Now, we need to create the drawables for the different backgrounds. The indicator under the active tab comes from the background drawable, so in our custom version, we’ll include an indicator in the proper color. To do this, I used a hack where I create a layer list with a rectangle shape with a 5dp stroke around the exterior, then offset the rectangle so that the top, left and right sides are outside the bounds of the view, so you only see the bottom line. This works pretty well, but if you know a better way to accomplish this, I’d be very interested to hear about it. In the case of the “pressed” version, the fill color is set on the rectangle to indicate that it is pressed. This entry was posted in Uncategorized and tagged android, java, mobile on August 28, 2013 by alwold. A year or two ago, I had my washing machine stop working and I called someone out, only to have them tell me it wouldn’t be worth it to fix it. I had to pay a $60 or so trip charge, then another bunch of money for a new machine. So, when my girlfriend Kristian told me her washing machine wasn’t working, it seemed like a waste of time to even have someone come out and take a look. We entered the symptoms into google, though, and found a possible fix that was pretty cheap if you do it yourself. The washer was making grinding noises and wouldn’t spin or agitate, so apparently that is common if you have a broken “motor coupling”. This guide I found online was very helpful. With that in hand, I decided to tear the thing apart. In the worst case, it would have to be replaced, so it was worth a shot. Plus, it would be fun to take it apart. Apparently, most top loading washers are pretty similar in design. Hers is an Estate TAWX700JQ2. Estate is a cheaper line that is made by Whirlpool. Looking through the guide, I found that the first step is always to loosen the control panel and flip it back. There are a few different ways to open the control panel, but none of them seemed to work. Finally, I found a guide that mentioned removing screws on the back of the machine. I took out four screws per the instructions and everything came loose. It turns out, you only need to remove two, otherwise you’re removing the whole panel from the little hinge things that are supposed to support it. 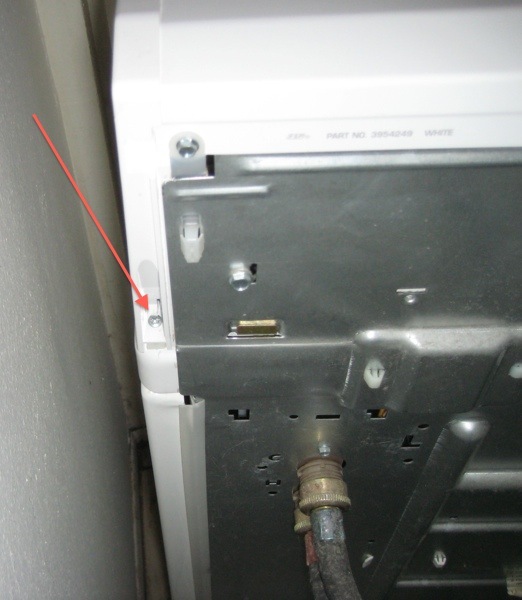 Here’s a picture with the screw that needs to be removed pointed out. It’s kind of at odd angle, facing upwards, but that makes it easy to remove without even pulling the washer out of its spot. There are two of these screws, one on each side. Once you have the control panel loose, you need to disconnect a wiring harness that plugs into the lower part of the cabinet, then pop out two clips, which appear to be exactly the same as in the guide I linked earlier. Once that is done, you can pull the cabinet off easily. At this point, you can see the whole guts of the machine, and it’s pretty exciting. 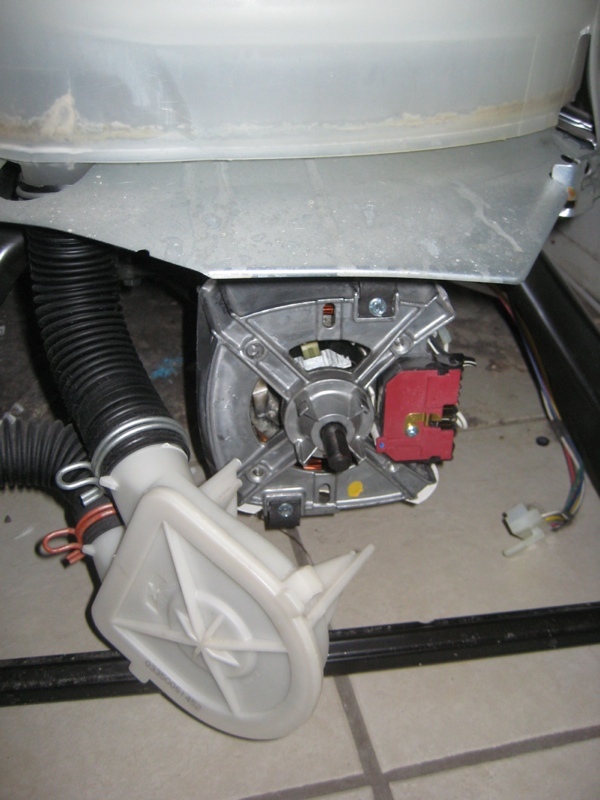 Next, you unplug the wiring harness from the motor (there was only one on this model, contrary to the instructions). You remove some screws from the motor, pop off some clips, and it pops right out. When you remove the motor, you want to be careful because it’s pretty heavy. I put a bunched up towel under it, so it wouldn’t bang up the floor, but getting the clips off required some screwdriver prying, so I remove the towel for better access, and then ended up dropping it on the floor. Oops. With the motor removed, you end up with something looking like this. 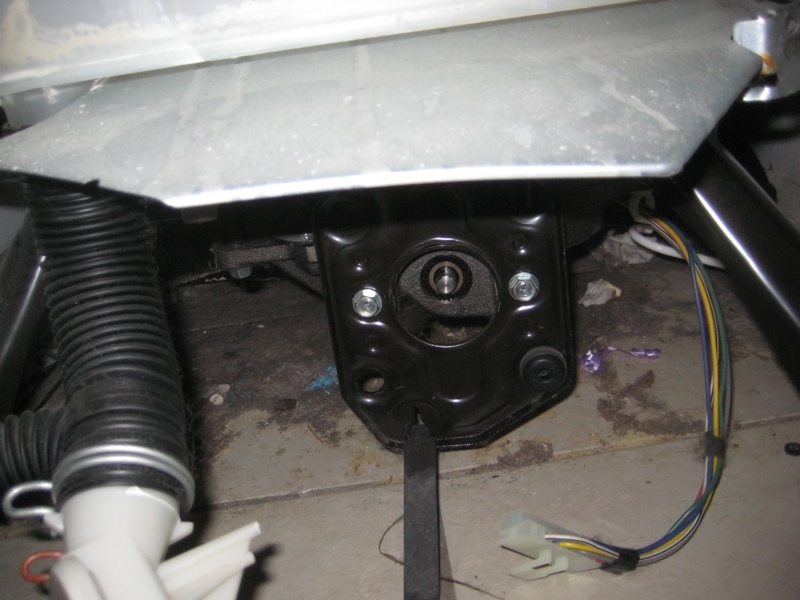 Here’s a picture of the transmission, where the motor was attached. In this picture, the coupling is removed, so you can just see the shaft. From what I’ve seen online, the motor coupling can fail in various ways, but as soon as I pulled out the motor, this one popped out and you could see it was just cracked in half. There are three parts to the coupling, and just the part connected to the motor was broken. I’ve seen stuff where it’s a lot worse. At this point, I had to stop and get the new part, but I think it probably took less than an hour to get everything taken apart. The next day, I picked up a part from this place, which had a location in Tempe. It was $14.99+tax, and I didn’t need to give them a model number or anything. Apparently this part is common to all direct drive washers. 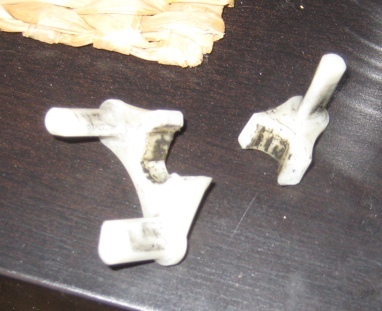 As I mentioned before, there are three parts to the coupling. The next day, we removed the rubber ring, and the part that attaches to the transmission (we needed to use a pliers to pull it off), then put all the new parts in. The new parts didn’t mount on the shafts of the transmission or motor very easily, so we had to use a rubber mallet combined with a wooden dowel to pound them in. After the new parts were mounted, it is slightly tricky to line everything up when you put the motor back in, but otherwise everything went very smoothly. After everything was back together, the washer worked again! Hooray! 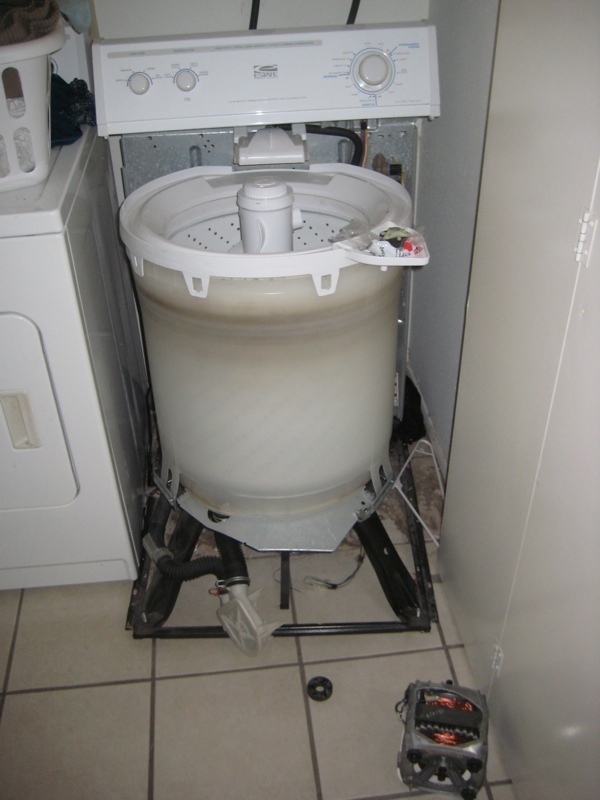 After this experience, I think the mystery of fixing a washing machine went away, and I wouldn’t be hesitant to attempt more complicated repairs. It’s pretty easy to take apart, and the internals seem pretty simple. Another funny thing to mention is that this was all done without removing or turn off the water supply. I wouldn’t recommend doing it that way, but in this case, the shutoff valves were not working, and it would’ve taken much longer if we had to replace those first. This entry was posted in Uncategorized on May 12, 2013 by alwold. One of the advantages of working from home is that I have complete flexibility in my work area. Over the past year or so, I’ve been experimenting with using a standing setup for part of the time. After using the setup for a while, I think I like it. I can’t say it’s dramatically improved the way I feel or anything like that, but given how sedentary the life of a programmer is, I think anything that burns more calories and causes you to move around more is good. I think desk workers also have a tendency to hunch over and mess up their posture, and standing up seems like it helps avoid that. 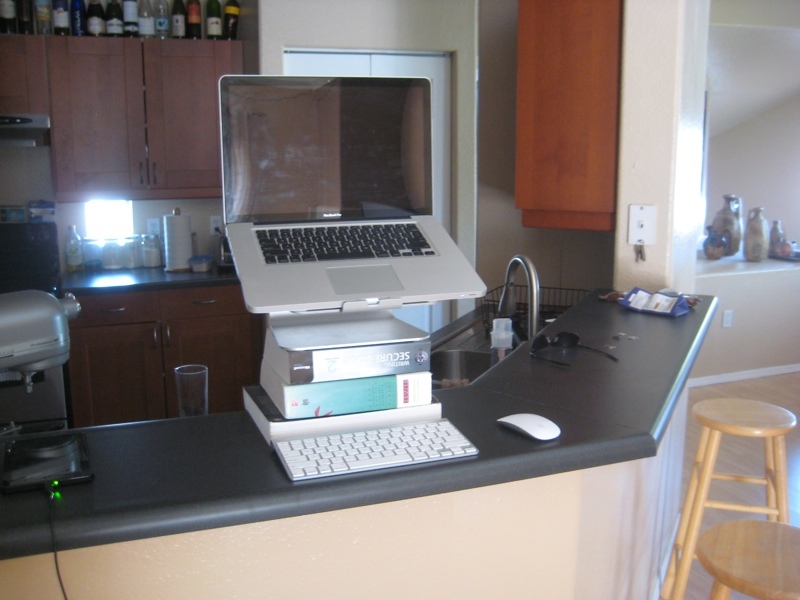 It’s pretty easy/cheap to experiment with a standing desk, so I would definitely recommend it. 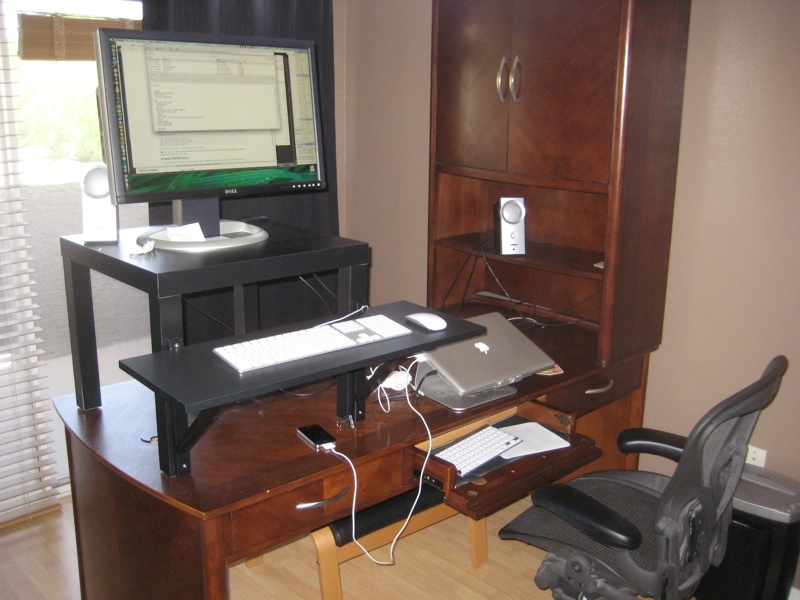 Putting the monitor at a height that lets you look straight ahead seems to provide the most comfortable position for the neck. This entry was posted in Uncategorized on May 5, 2013 by alwold.